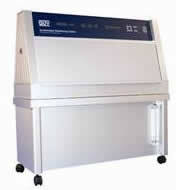 The QUV is used in more labs throughout the world than any other accelerated weathering tester. In just a few days or weeks, the QUV can reproduce damage that may occur over months or even years outdoors. Ultraviolet light causes almost all the photodegradation to materials exposed outdoors. The QUV tester reproduces only the UV portion of the spectrum. Our UVA-340 lamp is the best available simulation of short-wave sunlight. It is especially useful for comparing the performance of different types of polymers and stabilizers. It is the best lamp for correlation studies. Products outdoors can be exposed to moisture, in the form of dew, for up to 15hours per day. All models of QUV provide a rigorous, yet highly realistic, moisture exposure with cycles of hot condensing humidity. A QUV/spray can simulate the effects of rain, such as thermal shock and erosion. *The maximum and minimum irradiance will be influenced by the UV exposure temperatures and the ambient laboratory air temperature. Klik tombol di bawah untuk menambahkan QUV Accelerated Weathering Tester ke Daftar Keinginan Anda.